The three ladies are among 41 pilots in the squadron. While opportunities are growing and there is no gender barrier, women still make for a very small number of air force pilots. A posting in the northeast is a must for military aircrew, believe the three female Indian Air Force pilots, the first all-women crew to land at the Tezu Advance Landing Ground (ALG) in Arunachal Pradesh. On December 28 last year, the all-women crew of Hornbills (59 Squadron) under Eastern Air Command flew the Avro-HS 74 in one of the transport operations of the unit in northeastern skies. Wing Commander Tima Mathew, Squadron Leader Jaya Singh and Squadron Leader Kavita Prabhu were part of a mission, in which seven aircraft of the 59 Squadron took off from Guwahati, and landed at different ALGs the same day. The 59 Squadron recently celebrated sixty years of happy landings at the Air Force Station, Borjhar, Guwahati. Hornbills was raised on November 1959 at Jorhat in Assam, equipped with the DHC-3 Otter aircraft. It moved to Guwahati in 1987 and now operates the KD series Dornier and Avro aircraft. The unit is presently engaged in providing air support to inaccessible locations in the hills as a Logistic Air Support (LAS) squadron and acts as a bridge to the various ALGs in Arunachal Pradesh – Walong, Tuting, Tezu, Ziro, Pasighat and Mechuka. “This mission was carried out to give exposure to all the young pilots of our squadron. We are ready to accomplish any given mission. There are many ALGs in northeast which are yet to be explored,” says Jaya Singh. With 3000 plus flying hours, Jaya speaks about her experience in the northeast, saying that it exposes them to a new dimension of flying. “The mountainous terrain and weather in the northeast pose bigger risks than flying in the rest of India. Weather remains unpredictable, and you need to be prepared for any diversion or emergency at any time,” she says. The pilots feel that the Tezu runway measuring 5000 feet is short for landing an aircraft like the Avro. The load capacity for an Avro is 3-4 tonne and the aircraft can carry a maximum of 40 passengers at a time and 21 stretchers. “Not all the ALGs in the northeast are suitable for landing an aircraft yet, but as they provide many advantages during operations, IAF is planning to operationalise many of them. A runway of at least 8000 feet in length is adequate - you need real skills to land at Tezu and other ALGs. But as part of the training, we practice short field landing techniques and are aware of the dangers,” says Jaya. The Advanced Landing Ground at Tezu is perched at a height of about 500 feet with hills in one direction and vegetation on the other side. The three ladies are among 41 pilots in the squadron. While opportunities are growing and there is no gender barrier, women still make for a very small number of air force pilots. “Female officers are often few in number in any squadron. 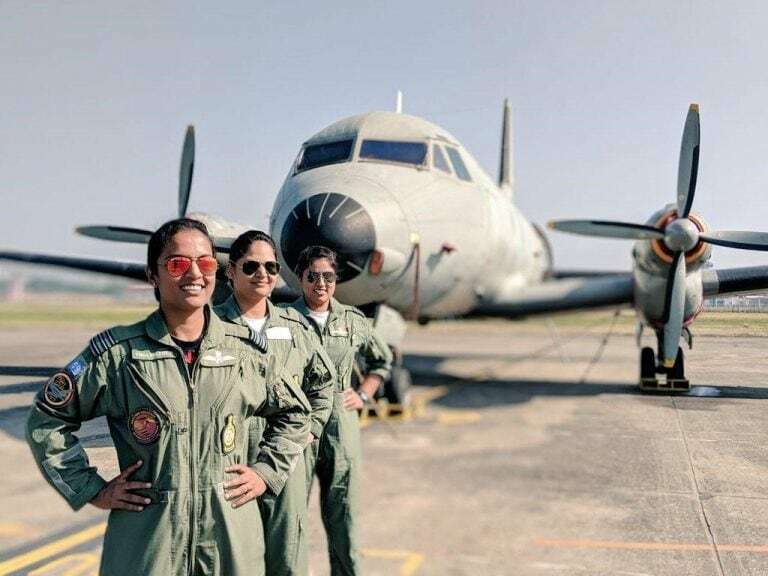 But doors are opening up for everything … it is just a matter of time,” says Tima Mathew, who observes that the same effort goes in to train women to become military pilots. Tima and Jaya are mothers, married to air force pilots. Jaya met Squadron Leader Nishit Tare during her training and they couldn’t help falling in love. The couple got married in 2010 and have a one-year-old daughter, Nishka. Her husband takes pride in her work, and also takes care of their daughter when his wife goes flying. “Jaya has been able to handle both the home front and office effectively. I am proud of her – she has achieved what others have not been able to at her age,” said Tare. Wing Commander Tima Mathew and her husband, Wing Commander Karan Kapoor, who is a C-17 pilot, have been happily married for ten years with a 6-year-old son. “We are course mates. My husband is at Hindon (Air Force station), and my son is under his care while I am stationed here. Karan can look after the home and the kid just as well when am not around,” said Mathew, who is celebrating her wedding anniversary this Valentine’s Day.